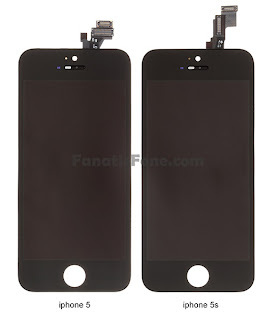 ﻿﻿﻿﻿﻿﻿The apple iphone 5s display assembly has been showcase in high-resolution images that were posted. We all know that Apple did not unveil the next version of Apple iPhone at the WWDC event that commenced a few days ago. And for those wondering whether Apple would launch a new iPhone or not, we have interesting news. FanaticFone was able to get their hands on some high-res images that actually show us the display assembly of the upcoming Apple iPhone, ‘Apple iPhone 5S as FanaticFone points out. we see in these images are the two display assemblies of different versions of iPhone, at least that is what the source indicates. And even though there is a possibility that these images actually show us an iPhone 5S in the making, it is also possible that the images could be showing the display assembly of an old iPhone 5 prototype. It is also possible that the images are mere mock-ups created with the help of technology. But if we do assume that the image is legitimate, then we can make another very important conclusion that will help us understand the iPhone 5S in a better way. Because if FanaticFone has been able to get the images of the iPhone 5S display assembly, then it is clear that Apple has made minor changes to the device, and has also used the same screen size. This would mean that Apple iPhone 5S will also be a smartphone with a 4-inch display and some improved hardware. This would also indicate that the latest rumors about Apple working on a new iPhone with a 5+-inch display are not true.